Finally, a script installer shares the easy How Tos on . 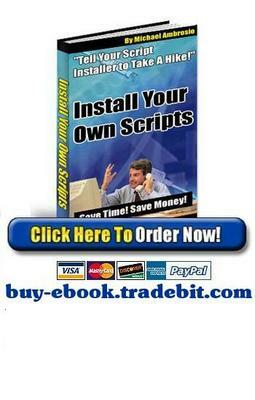 . .
How To Install Virtually ANY Script On Your WebSite Yourself and Save Tons of Cash - Today! You will discover what script installers hoped youd NEVER learn. Just how SIMPLE it is to install virtually ANY Perl or PHP script on your website. Once you get this Incredible ebook you will have all the confidence to install your scripts yourself from that moment forward! Once you read this step-by-step guide to installing scripts, you will wonder why youve been paying others to do it for you. In fact, you will be astonished at how easy it really is! Doesnt it just annoy the heck out of you when you purchase a nice new script - say an autoresponder, or a membership manager or something like that, and you find they want even MORE money to install it for you? And doesnt it annoy you even more when their web page says something like, Let our certified installer install this for only $1.99, as if there is some deep, dark mystery to installing it? Certified??? Puhlease!!! Great! So NOW here you are, trying to make heads or tails out of the installation instructions to see if you can do it yourself. Only you run into these strange words . . . such as cronjob; chmod; MySQL; Unix, cgi-bin - What the!?!? its enough to make you crazy! So now your nice new script sits on your computer, just waiting for you to scrape together a little extra cash to have a professional script installer put it in for you. This is EXACTLY how it works. I know because I am a script installer. I have installed HUNDREDS of scripts for many people. I remember before my first installation how it all seemed so mysterious to me. It was one of those things that you see every day but pay no attention to. Sort of like telephone wires. You can compare a website with no scripts installed with a house with no telephone lines. Nothing wrong with it. You can get by. But you ca not communicate with people unless It is in person. If you intend to run a business of your own, would you try to do it without telephones? Or even a computer? I would think not. If you plan on trying to make money on the internet you will eventually need scripts installed at least if you want to run your internet business correctly and more efficiently. You get the idea. You could manage certain aspects of your web business, but youd really be missing the boat in many ways. I was just like you once. I did not know how to install a script. I didnt have the extra cash to have it done. It sat on my computer for weeks. Until one day when I NEEDED my autoresponder installed. So I researched, read, emailed people, made a complete PEST of myself until I learned how to install that script! And I DID! But I FRIED my BRAIN in the process. What a learning curve. Know what I learned? There is no mystery. No deep dark secret. Just having the right information. This comprehensive and detailed ebook was written so you can tell your script installer: Take A Hike! Dont Need Ya! - Take the Techno out of Techno-Speak: Easy to understand definitions. - Take you by the hand tutorials using screen captures and actual scripts. - Surprise Super Secret bonus script - that you get to keep! - Handy server tools to gather needed information about your server quickly. - Little known resources where you can find TONS of free scripts that you can download and keep. - Guide to selecting free and inexpensive tools. - Unravel the mystery of setting up a database. - Learn how to automate your scripts. - Keep unwanted intruders out - password protection made simple. - How using one simple script can actually save your business - and you get it free!